Georgia O'Keeffe began spending summers in New Mexico in 1929, and over the course of the next six decades she turned her brush to the richly colored scenery of the American Southwest. Here, red hills fill the canvas from edge to edge, while the bleached bones in the foreground reflect the hot, dry climate of the region. Like many of O'Keeffe's landscapes, this painting represents a location near her house, Ghost Ranch, distilled to poetic, abstracted shapes that reflect the monumentality she finds in even the simplest natural forms. This painting came to the Museum from the Alfred Stieglitz Bequest, which Georgia O'Keeffe administered. O'Keeffe met the photographer in 1916, when he first became interested in showing her work at his 291" gallery in New York, an early center of avant-garde activity in the United States. Stieglitz soon became her dealer and, in 1924, her husband. Red Hills and Bones represents an actual location near O'Keeffe's New Mexico home, but in a number of ways she has distilled her personal experience of the landscape to extract a symbol of something larger and more permanent. No glimpse of sky nor even breath of air alleviates the intensity of these desolate but richly colored hills that fill the picture from edge to edge. The bleached animal bones looming in the foreground serve as monumental reminders of the struggle between animate and inanimate forces so keenly evident in the western desert; O'Keeffe in fact prided herself on being one of the few who were creating a truly American art. John B. Ravenal, from Philadelphia Museum of Art: Handbook of the Collections (1995), p. 329. 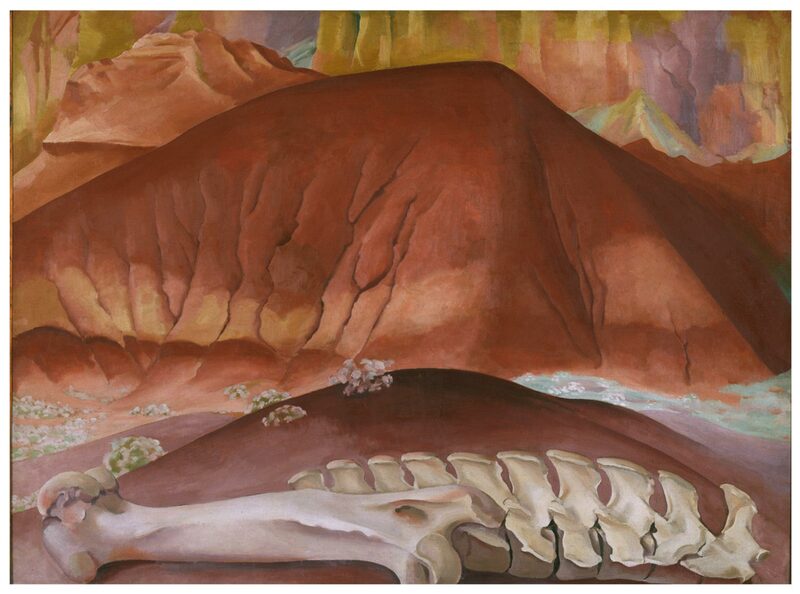 Red Hills and Bones is one of the many interpretations of the New Mexico landscape that Georgia O'Keeffe painted over the course of six decades. Living in Manhattan, she began in 1929 to spend summers in the American Southwest. The American modernist artists championed by her husband, Alfred Stieglitz, were very much preoccupied with the need to invent a distinctly native modern aesthetic. Many of them found their primary sources in the urban cityscape of New York City, but O'Keeffe turned to the far-off landscape for indigenous inspiration. Here she sets an arrangement of bleached bones—a cow's leg bone and spinal column—against the dry, cracked red earth of the hills that surrounded her New Mexico home. Across the horizontal composition stretch three echoing forms: the large red hill, the small brown mound in the mid-ground, and the arc of white bones immediately before the viewer. This trio implies a progression of aging; the large red hill, split with erosion to suggest folds of wrinkled skin, seems to have decomposed to reveal a spine that stretched beneath and supported the once-fertile landscape. The small bunches of flowers scattered over the small brown mound suggest the renewal of life from decay. O'Keeffe's highly focused rendering of her landscape, to the complete exclusion of the wide Southwestern sky, recalls the close-up views of flower blossoms from the 1920s for which she is most often celebrated. This intensely cropped composition monumentalizes the simplicity of organic forms and ultimately confirms their symbolic power. O'Keeffe's rich palette of reds, oranges, browns, and yellows evokes the earth itself, as if she dipped her paintbrush into the soil as she stood before her subject. Twentieth Century Painting and Sculpture in the Philadelphia Museum of Art (2000), p. 85.